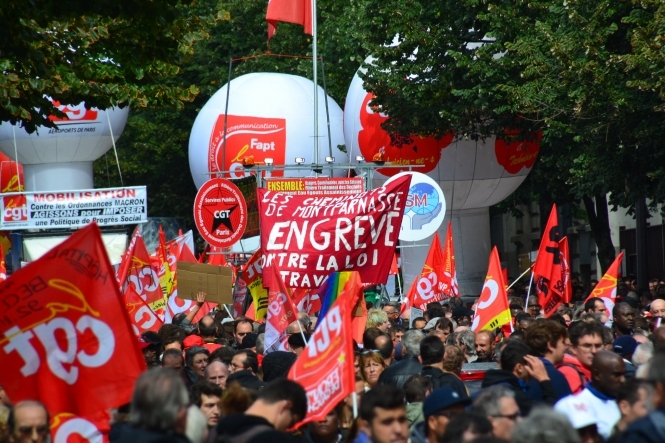 Minor disruption to planes, trains, public transport services - and even national radio programmes - have been reported around the country as workers join a fourth protest against President Emmanuel Macron's labour reforms. For the first time, Force Ouvrière has joined the militant CGT and called on members to join the walkout. A total 170 demonstrations are expected to take place, but overall disruption is expected to be minimal as support for the protests appears to be on the wane. Mr Macron used executive powers to sign the reforms into law at the end of September and published in the Journal Officiel. This latest round of protests takes place ahead of a debate in Parliament on a bill to ratify those laws, which begins on Monday, November 20. Despite the strike, the French Civil Aviation authority has said that it expected flights to and from France to operate close to normal after putting measures in place to offset any disruption. While Ryanair said on Wednesday that it would cancel 'a small number of flights', rival budget airlines Easyjet and Jet2 said they were expecting to run as close to a normal schedule as possible. Rail operator SNCF, meanwhile, said its TER and Intercite services would operate at 80% of normal levels, while Paris public transport operator RATP said it expected no disruption to usual weekday operations. Despite SNCF's promises, however, France Bleu Gironde has reported that a third of TER services in the department were cancelled on Thursday. Meanwhile, thousands of students in Montpellier faced a difficult journey to schools and colleges as the daily school runs were cancelled. Unions warned school buses in other towns and cities would also be affected. Some programming on Radio France has also been disrupted after the CGT and SUD Radio France unions called on members to join the walkout. The programming is disturbed this Thursday on the antennas of Radio France. And for good reason: the unions CGT and SUD Radio France called in a statement all employees of the group to stop work to participate in the events. A march in Paris from place de la République to place de la Nation starts at 2pm.